If you’re a parent of a teenager I think it’s safe to assume we’d agree they are interesting beings. You never quite know what you’re going to get from one day to the next. Hormones wreak havoc with mood, and neurochemistry is in a state of constant flux. It’s no wonder consistency is NOT a word we tend to associate with adolescence. With 13 and 16 year olds living under our roof, my wife and I never know what mental state the boys will be in with the start of each day. What I can share is the mornings they have difficulty focusing, seem irritable. disorganized or gloomy, that a poor night’s sleep is generally the cause. The days they have bright and sunny dispositions, clearly followed a sound, restful sleep. According to the National Sleep Foundation teens need about 9 1/4 hours of sleep each night to function best (for some, 8 1/2 hours is enough). Most teens do not get enough sleep — one study found that only 15% reported sleeping 8 1/2 hours on school nights. Sleep is vital to sound brain fitness, so we make it a priority in our family. House rules for the boys include no television, video games, or computer time on school nights. Caffeine is strictly off limits. Lights need to be off at 9:30 pm unless the boys have school or related activities which require them to be up longer. And, they are responsible for getting themselves up, on time. On weekends we lighten up, but can tell you if they stay up too late on Friday or Saturday they sleep too long and definitely don’t function well. Irregular sleep patterns on the weekends disrupt their biological clocks and hurt their quality of sleep during the week. But try to convince them of that when the Xbox beckons! The older of our two teens sleeps well, the younger not so much. A couple nights ago he wanted to try our new auditory sleep aid so my wife handed him the iPod shuffle and SleepPhones and he started to listen. She left to do something and came to get me a few minutes later. 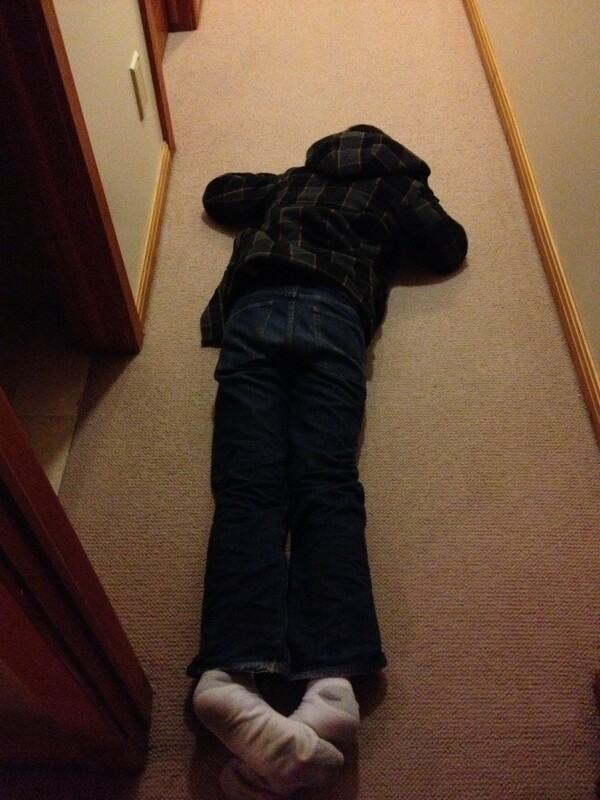 As you’ll see in the picture above, he didn’t even make it down the hallway, much less to his room to sleep. He crashed, immediately, lights out! Pretty exciting considering what a problem sleeper he has been. Needless to say he’ll soon have a TLP SLEEP system of his very own! If you have sleepless teens, or have your own sleeping difficulties, you might be curious to know what was able to put him to sleep so quickly and naturally. This white paper by neuroscientist Dr. Seth Horowitz explains how this powerful sound and music technology works. Tell me, what are the biggest concerns you have about your teenagers not getting the sleep they require?